A sure-fire way to spruce up your indoor/outdoor living space is to grow Rhododendrons. These plants bloom clusters of bright and spectacular flowers in the late spring. When watered right, their large, leathery leaves stay green all through the winter and keep your space fresh and deciduous. The flowers appear to be funnel-like or bell-shaped. Depending on the variety, the flowers may have a nice fragrance too. Rhododendron prefers moderate climate- not too cold or hot. To develop flower buds, they prefer the chill climate. The plant is available in yellow, white, red, pink and purple colors. Although a typical rhododendron might flower in spring, there are some varieties that can bloom in summer as well. There are a couple of popular varieties of rhododendrons. It is an evergreen shrub that flowers lush yellow blooms that look quite elegant with glossy green leaves in the background. It blooms lavender colored flowers in the mid-spring and can grow up to 4 feet. This variety bears clusters of white flowers in spring. It prefers deep shade and is sensitive to overwatering. It is a short shade loving plant that blooms bright red flowers. A great choice for indoor planting. This is a hybrid variety that blooms bell-shaped pink flowers. It requires good fertile soil. So, you should plant it in compost to get full blossoms. This is a long growing rhododendron that could grow up to six feet. It is semi-evergreen and blooms in the month of April. Pruning of this plant is necessary to keep it vibrant throughout the year. You can grow Rhododendrons from seeds, cuttings or saplings brought from the nursery store. If you are not sure about the type of flower ‘a seed growing into a plant’ would bear, getting a cutting of a Rhododendron of your liking helps. The best time to plant is during spring or early fall. Once planted, give your rhododendrons dappled shade as they struggle in full sun and deep shade. A spot that is sunny during the early hours of the morning and receives shade at noon and evening is a perfect spot for the plant. The soil you plant it on should be moist, humus-rich, well drained and mildly acidic at pH level 5 to 6. If the garden soil is poor, use peat moss and compost. As rhododendrons have shallow root systems, they need mulch and moist soil to stay hydrated, especially during summer months. To plant a rhododendron, dig a hole that is twice the width of its root ball and deep enough to hold it. When planting multiple plants, place them 2 to 5 feet apart. Do not plant too deep to avoid rotting of roots. After digging the hole, water it and let it settle. Partially add the loose soil, place the plant and fill the remainder with compost and soil mix. To grow a healthy rhododendron, buy suitable varieties of plants from the nursery. Pay attention to the time they blossom- fall, July, March or some other timing of the year. Buy plants that are healthy with deep green leaves, well watered and not wilted. With your finger, check the condition of the soil. If the soil is bone dry, avoid buying them. Indoor rhododendrons should be watered relatively less and the soil needs to be well drained and rightly acidic. Use a peat-based potting mix without lime. During the growing season, feed the plant with high potassium fertilizer every two weeks. To give a sufficient amount of light, place the pot in a well-lit room and avoid direct sunlight. To keep the plant healthy, the room temperature should be between 16-21°C or 60-70°F. Rhododendrons need to be watered thoroughly until they are established. As these plants can absorb water from their leaves, its necessary to water their foliage and also around the roots. The best time to water these plants is during the morning. This allows them to absorb water and dry off until day’s end. Try to avoid watering in the evening as you can put them in the risk of mold growth. It’s important to fertilize rhododendrons once the blooming season is over. As the flowers start to fade, add a good fertilizer to give it a nutrition boost. Also, apply mulch to the area to help the soil retain moisture. Use a slow-release acid forming fertilizer to give the plant a continuous source of nutrition through the rest of the seasons. Cottonseed meal or rhododendron food may be a good choice in this case. Pruning a rhododendron is necessary to stimulate new growth. The right time to prune the plant is when its leaves are dormant and a few have turned yellowish. Pruning gives rhododendrons symmetry as they tend to grow haphazardly. While pruning a rhododendron, remove dead flowers, yellow and dry leaves. When you pot a rhododendron and grow it indoors, pay attention to the soil, temperature and amount of sunlight it receives. They are one of the classic flowers with cluster beauty that have been featured in many literary works such as Emerson’s well-known poem, “Rhodora”. So, brighten your space with these large, beautiful flower clusters. 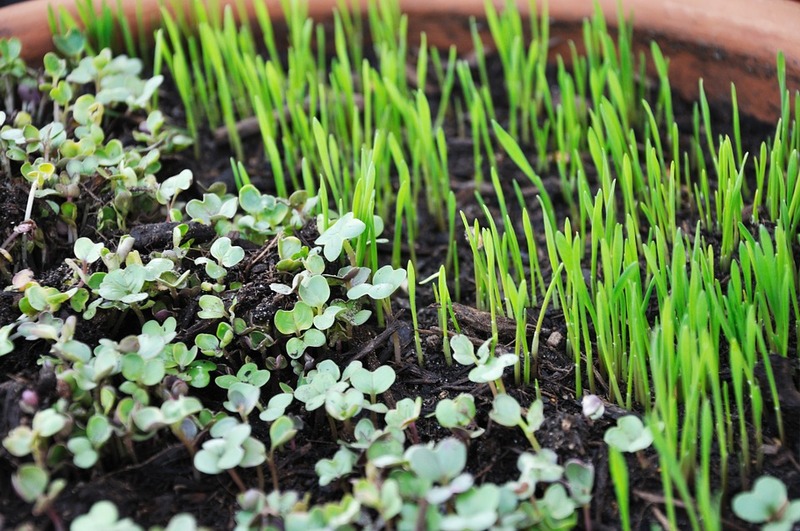 Microgreens are among one of the fastest-growing crops. Go to any food stall or restaurant and you will likely find one of these microgreens adding color, and flavor to most of the dishes. These tiny seedlings are perfect for windowsill gardens. To grow these microgreens indoors, one must have crucial things available at his place. Go through this brief article to get an insight into the steps that you will need to follow when growing microgreens at your house. To begin with, you have to have a container to grow the microgreens. Gently sprinkle the moistened potting soil throughout the container. The layer of potting mix must be around 2 inches from the base. Then take a cardboard and gently flatten the soil. Take note that it must not be overdamped. Once the potting mix is scattered and leveled in the container, take the seeds and sprinkle them uniformly on the surface of the mix. Again, either with your hands or a cardboard, press the topmost layer to flatten it. Take care of the force that you exert, because too much of it can cause issues. In most of the cases, seeds need a layer of soil over them to start germinating. Here for the microgreens, you need to cover them with a thin layer of soil. You can also use vermiculite for the same. Vermiculite keeps the seeds damp by absorbing the water. Do it gently so that water soaks the vermiculite and does not wash away the seeds. After watering the seeds, place the container in a sunny location, preferably south-facing windowsill. Hang on for a week or perhaps a day or two more than that to let the seeds germinate. To maintain humidity, you should cover the container with a lightweight sheet of plastic. Not only does it promote germination, but it also encourages the growth of seeds into sprouts. All this while, mist the soil once or perhaps twice every day to keep it moist. Don’t let it get too wet because it might hinder the growth of the microgreens. Also, keep the container in a light heat source like a mat or a pad so that the seeds can start. When the seeds are finally germinated, take off the plastic cover and remove the heat source as well. Make sure that the planting medium stays damp during the period. Water it from the bottom by pouring it into the tray in which the plant container is placed. This allows the soilless mix to absorb the water and help microgreens grow properly. 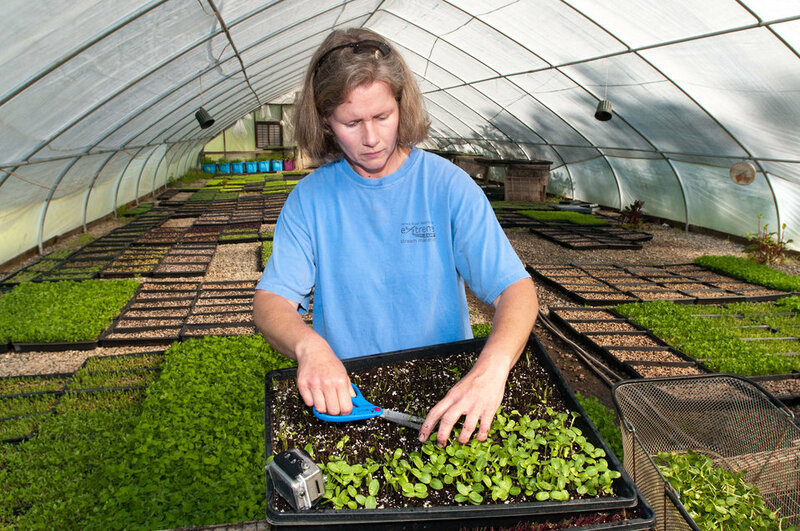 Microgreens grow properly only when they receive at least four hours of direct sunlight every day. If the season is relatively colder, the exposure time has to be increased. If there’s not enough of the natural one at your place, you can use grow light as well. Use one which has comparatively lesser heat output for a simple reason that you don’t want to overheat the plant. If the leaves of microgreens appear to be leggy or pale green, it’s a sign of lack of sun exposure. Depending upon the type of seed, the greens in your home get ready to be harvested in two to four weeks after plantation. When you see the first true leaves unfurl, take it as a sign that the time has come to harvest the microgreens. Take a scissor and snip the plants just above the soil line. 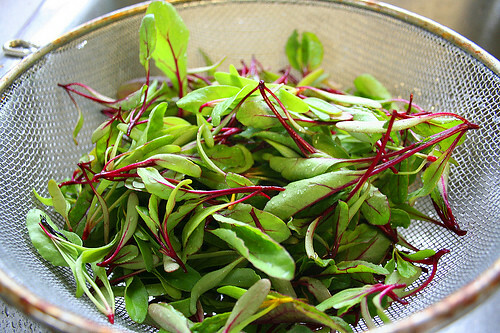 Now chop them and use them to garnish your salads, veggies, and other dishes. They make a healthy addition to the food items while giving them a beautiful sight at the same time. Also known as gladiola, and glads, gladiolus are popularly grown to enhance the beauty of bouquets. Ranging between 2 to 5 feet in length, the trumpet-shaped flowers come in every shade, except blue. If you want to plant these South African native flowers in your garden, certain things have to be ensured before you get started. Corms, also known as bulbs, should have thick centers if you want the flower to bloom properly. If you desire the gladiola in your garden to reach a length of 2 to 3 feet, choose the corm whose diameter ranges between ½ and ¾ inches. If you go for the corms that are about an inch in dia, the flowers will grow much larger. Store the corms in a cold and dry place before they get ready to be planted in the yard. Make sure that the temperature inside the storage container does not fall below freezing point. This can damage the bulb. Gladiolus bloom the best when they get full sun. Although you can witness their growth in partial shade, the colors of flowers in such case won’t be as vivid. To give your yard the desired astonishing colors, you must plant gladiolus at a spot where it gets enough of sunlight to grow and lush. 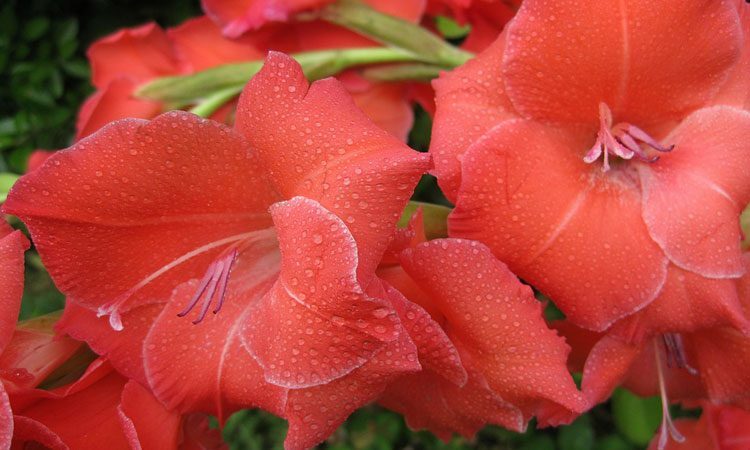 Generally, the gladiolus prefers to grow in sandy loam soil, which has got exceptionally good water drainage. But any soil that is ideal for veggies is great for gladiolus. Heavy and wet soil can cause the roots of the plant to rot. If your yard is filled with clay soil, loosen the soil to a depth of 12 inches before you plant gladiolus over there. It is better to plant them in spring to get the best results. Hang on for the last frost in your area to pass before you take those gladiolus corms to the plant in the flower bed. If everything goes according to the instructions, it would take around two and a half to three months until the plant begins to flower. Once the corms have been sowed with their pointed sides in upward directions, water the entire area uniformly. Also, you should water the bed 1 inch every week, especially if the rainfall isn’t sufficient to fulfill the needs of the gladiolus. The amount of water must be increased during the drought periods. Weed competes with gladiolus for the water and thus has to be controlled. Gladiolus grows well when the soil remains a little moist. To avoid this from happening, you should mulch the soil once the plants start to emerge from under the ground. A 2 to a 3-inch thick layer of either straw or bark would serve the purpose very well. 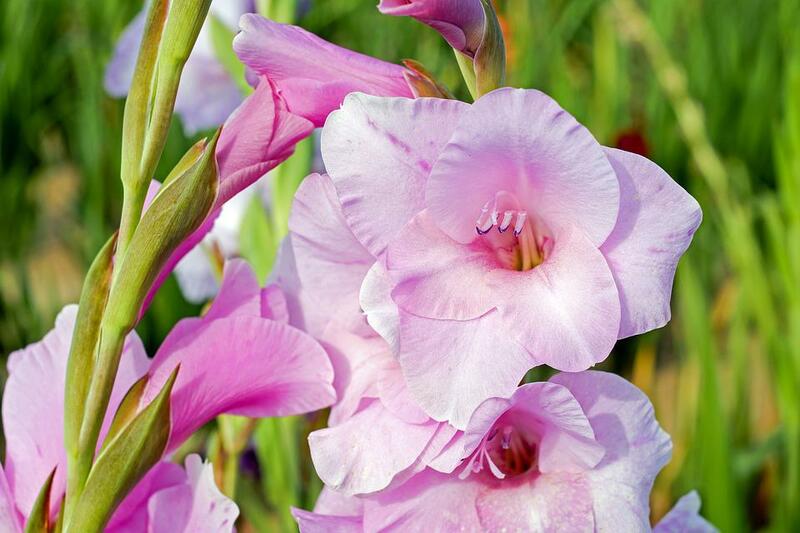 To protect gladiolus from the insects, spray the pesticides which contain Malathion or carbaryl. This has to be done when the gladiolas have achieved a length of about 6 inches. If you delay it, the damage that it causes will be irreversible. Keep it in your mind and take good care of the plant and take every necessary action at the prescribed time as well. Summer storms can cause the tall gladiolus’ spikes to flop over or bend. But this can be prevented by staking the flowers. Make sure you do this early on in the process so that the roots and the flowers don’t get affected by the supports. Remove the stakes once the flower is ready to be harvested. Avoid the heat of the day and cut the stalks of the flowers early in the morning, or at night time. You need to cut them diagonally before you store them. Don’t store them as it is. Bring with you a container which has lukewarm water in it. Then place the container in a cool and dark place before finally putting the gladiolus flowers in a vase or a bouquet. Honeysuckles grow as crawling vines, shrubs, and even bushes. People love them because of their sweet fragrance. Not just humans, but birds are attracted towards them because honeysuckle flowers happen to produce nectar for them. Honeysuckle flowers are often used for decorative purposes, especially in the form of hedge along the compound walls and fences. Besides beauty enhancement, they have also been used for medicinal purposes as well, especially in Chinese medicines. Being versatile, they don’t prefer any particular type of soil to grow. Although it is quite easy to grow honeysuckle, you need to know a couple of things before you get to work. Honeysuckle plants want the full sun to flourish, but they can also tolerate some amount of shade. Make sure that the location you choose receives considerable sunlight. Without enough exposure to the sun, the leaves of honeysuckle flowers will start to shed. Although it does not require any particular type of soil, it must be able to drain off any excess water content in it. Since the honeysuckle plants attract butterflies and hummingbirds, choose the spot where people don’t walk. When it comes to watering, you must understand that honeysuckle plants are sensitive to the moisture and water it receives over the time. During the initial stages, they need you to consistently water them so that the soil remains evenly moist. Once they establish and start to bloom, you only have to water it when the temperature gets too warm, and conditions of drought arise. Watering at the same rate throughout the process can harm the health of honeysuckle flowers. To maintain the moisture retention of the soil, you can add a layer of mulch to it. A 2-inch layer of either leaf or shredded barks would be sufficient for the purpose. Plant them in your garden once the threat of frost has made its way out of your area. The ideal weather to grow them in is spring of the colder climates. This keeps their roots shaded and cool. You need to plant them at a soil depth of about 18 inches. It must be noted that an adequate amount of air is given to the plants so that molds and powdery mildews don’t develop on their surface. These flowers don’t require a lot of fertilizer to grow. Do it with a controlled release variety in the beginning. A balanced fertilizer around the base of the plant is what is crucial for honeysuckle flowers to grow. To encourage the blooms of honeysuckle flowers, use a balanced liquid fertilizer for the purpose. Be careful that you do not fertilize it more than it requires. The signs of excessive fertilization don’t show up at first, but it renders the growth of flowers in a long run. All this while, keep measuring the pH of soil and maintain it between 6 and 8. If you grow them as ground cover, they don’t require any support. 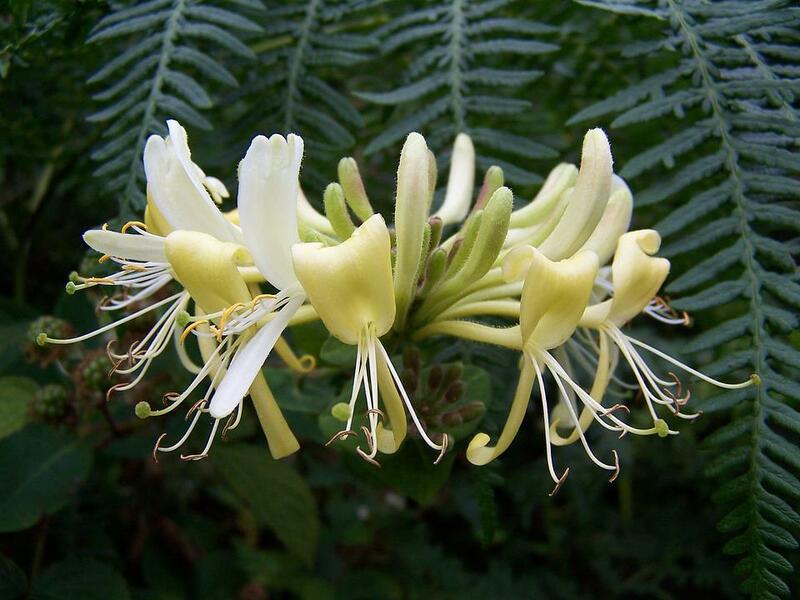 However, if you desire the honeysuckle flowers to climb up, they certainly need some sort of support to get going. If there’s a wall near the plantation area, then there’s nothing to worry. But if there’s nothing around, you must insert a support structure prior to planting the plants. Don’t do it after planting because this can damage the roots of the flowers. Let the honeysuckle plants establish properly before you take out the tools to prune. Doing it too early can have adverse effects on the number of blooms. It can sometimes kill the entire plant as well. 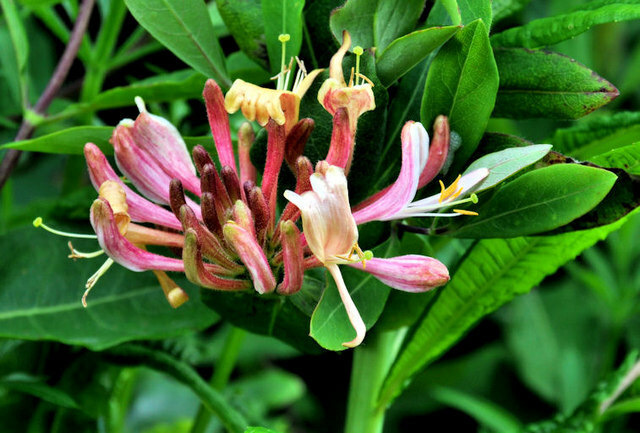 The growing period for honeysuckle plants before pruning the old and bloomed out flowers is generally two years. It is necessary to prune the honeysuckle flowers so that the later flowering can be encouraged. Butterfly Bush, biologically known as Buddleia Davidii, is one of those adorable plants that make their way to every gardener’s ‘bucket list’. It’s famous for its long panicles and brightly colored flowers. The bush sprouts in a range of rich, vibrant colors, blossoms through the entire fall, and of course, intrigues hummingbirds and butterflies by the score. This plant is hard-natured ( USDA plant hardiness zones 5 – 9) and can tolerate extreme intensities of weather. Though it blossoms in the spring season, the glossy green foliage keeps the plant evergreen throughout the year. This is found as a small shrub that tops out at approximately 6 feet, though the flower size is small. It’s a good accent or background plant for a perennial border or cutting garden. Also known as Nanho Blue, Dwarf Blue is one of the tidier butterfly bushes. The name ‘Dwarf’ is a bit misrepresenting because it’s the flowers and leaves that are small in size, not the overall spread of the bush. The colored flowers look extraordinary with their little size with long bushes that may get over 12 feet tall. This pretty butterfly bush is of dark purple color surrounded by 10 feet tall bushes. Plenty of water and proper drainage is required to garden this. A hybrid butterfly bush (Buddleia x weyeriana), Sungold grows a lot of golden pom-pom like flowers. The plant is a dense, well-shaped shrub that could reach around 8 feet. The flower color in this type of butterfly bush is soft lilac with drooping branches. The flowers present a mesmerizing view like a crystal clear waterfall surrounded by the cooling effect of greenery. How to Plant Butterfly Bush? To plant a butterfly bush, you need a place where the soil comes with good drainage and there is plenty of space for the bush to grow. Though butterfly bush does not require fertilizers much, a wet soil and plenty of space could do a lot to its perfect growth. These bushes can grow up to 12 feet in length and 4 to 15 feet in its spread. As they are fast growing plants, you can decorate your patio and outside fences with this vitalizing shrub. As mentioned before, butterfly bush does not require fertilizers for its growth but certainly, need a wet and high-quality soil. It can tolerate intense conditions. For example, even in frosty cold weather, if the root zone of this plant is covered with 2 to 4-inch layer of mulch, butterfly bush could grow actively. There is one drawback of butterfly bush that its dried flowers do not shed down themselves. You have to remove them from the bushes to make it look tidy and beautiful. If you are good at deadheading, you can take a better care of your plant. Moreover, at the maturation stage, the plant releases its seeds that cause the weedy tiny plants to grow. So, to make your garden look lively and clean, remove all the dispersed seedlings as soon as possible. Otherwise, your place will get untidy with small, wild butterfly bush plants. If you cut the bushes from the plant, you should do that along with their roots and top growths as well. Otherwise, these will re-emerge soon. To make sure your garden brightens up with lovely blossoms of butterfly bushes, be consistent in trimming the dried flowers and rotten bushes on regular basis. Even during summers, don’t water butterfly bushes on a regular basis because excessive water will spoil their growth. You can place the bush pot even under the extreme sun. Sunlight is required to provide this plant a fresh and bright color. These bushes can grow seasonal caterpillars on their foliage and flowers, so watch out for it. Caterpillar turns the bushes pale. A proper termite free spray is recommended as soon as you notice your plant turning fade. The sweet honey aroma fragrance of butterfly bushes is an open invitation to butterflies as well as the caterpillars. So, prevent the shrubs from damaging and closely focus on the branches to detect any kind of caterpillars. Your bushes may get attacked by Japanese insects who feed on its flowers nectar and revoke the visit of beneficial insects to the plant. , Spray insecticides to eliminate the presence of such attacking insects to your bushes. There are a lot of benefits that come with butterfly bushes that overcome all the cons of this plant. Produces sweet fragrance and makes its surroundings fresh and lively. Finally, Butterfly bushes are hard to beat for sheer flower power as they are one of the longest blooming shrubs out there. Colorful flowers, exotic fragrance, a whirl of lush green leaves – these sun-loving plants are one of the best selections you could make to turn your premises green and cheerful. Gardening experts around the world have shared many tips on growing daisies, particularly the glorious Shasta Daisies. These delightful summer flowers are unanimously revered for their year-round foliage and ‘summer to fall’ blooms. They add lightness and density to all garden types. The fact that they are easy to grow and nurture makes these flowers even more appealing. Shasta Daisies possess the classical white petals with a yellow middle. There are around 20,000 types of plants in the daisy family and Shasta Daisies are one of the prettiest of Daisies. They also produce almost exponential blooms each year and are perfect for filling the bare spots in your garden beds. In 1901, Luther Burbank introduced the Shasta Daisy to America following 17 years of development. He called this hybrid Mt. Shasta. There have now been many new varieties of the Shasta Daisy created over the last 100 years. The incarnation began as Burbank loved the wild daisies which grew near his family home in Massachusetts. These daisies originally came from New England and were a common feature in English cottage garden. Inspired by these daisies, Burbank planted the seeds of another similar daisy, the Oxeye Daisy, on his land in Santa Rosa. The Oxeye Daisy is a roadside wildflower which spreads very easily and is also tolerant of extreme weather. Burbank decided to pollinate them with the English Field Daisy which has larger flowers. Then the best of these were scattered with Portuguese field daisy pollen and bred for 6 years. More than a half million flowers were grown, and the resulting daisies which were developed had extremely large and beautifully formed blooms on sturdy plants. Next, he produced the most promising of these with pollen from the Japanese Field Daisy. The seedlings grew larger flowers that were very white floating on vigorous plants. These new incarnations came to fruition in 1901. They were an entirely new species and named after California’s sparkling white ‘Mount Shasta,’ officially known as Leucanthemum x superbum – the Shasta Daisy. Shasta daisies have an especially long blooming period. Daisies bloom in clumps of white flowers with a yellow middle and glossy dark foliage. Shasta Daisies attract butterflies which makes the plant more fascinating! Directly sow seeds outdoors after frosty environment danger has passed and the soil begins to warm. Daisies like rich, well-drained soil. When planting for the first time, mix compost into the planting pot or garden bed. Fertile soil is a must for growing Shasta daisies. Remember, fertile soil is full of nutrients like potassium, nitrogen, phosphorus, calcium, sulfur, iron and magnesium. You need to loosen the soil to a depth of 12 – 15 inches and mix in some compost. Place the daisies in light shade or a sunny position but not in full shade. Keep soil moist especially during hot, dry seasons. Water thoroughly but don’t water. Add mulch around the plants with leaves, bark, hay, wood chips or straw. This will assist in cooling the soil. Staking plants is sometimes required, especially when grown in partial shade. Shasta daisies need regular pruning to prolong the blooming. Regular deadheading can increase the daisy blooming time by a couple of weeks to months. Daisies are rarely bothered by insects and disease. Generally, these plants do not need insecticides or fungicides. Still, if problems occur, treat early with insecticidal soap. Pruning is quite important for daisies. While pruning, cut the flowers when they begin to face instead of when they’re completely spent. You should cut the individual stems back to the base of the plant where it meets the foliage, especially for daisy varieties that produce single stems, such as the Shasta. If all the blooms have already dropped, cut the entire plant back to the base of the plant. This will assist to stimulate new growth and then result in additional flowering. Shasta daisies require very low maintenance. Nevertheless, there are some steps you can take to ensure your plant longevity as well as the flowering time. Every spring, apply some compost and mulch to help control weeds and build up the fertility of the soil. Shasta Daisies -a simple yet cheery inclusion for every garden – are popular on many continents. From the beginner to the more experienced gardeners, the rewards from these pretty blooms far outweigh the small steps it takes to maintain these classic flowers. Snake Plant is renowned for its adaptable nature, a variety of species as well as an array of usages. Due to their amazing hardiness and striking lines, this plant is hard to kill and hot favorite to people who can’t keep anything green alive. This diehard plant can put up with almost anything in anywhere whether you grow them in your garden, balcony or other indoor spaces. Snake Plant is generally known as Sansevieria though some people call it ‘mother-in-law’s tongue’ because of the shape and sharp margins of its leaves. This spiky beauty is adored for its bold and tough looks, pointed leaves and the amazing quality of purifying its surrounding air. Snake plants have approximately 70 species to choose from. You can see them in all shapes and colors – dwarf or tall, with flat, round or concave leaves, colored with dark green, light green, gold, silver, yellow, chartreuse, black or white. The most popular snake plant species are Black Robusta, Futura Robusta, Futura Superba, Cylindrica, Golden Flame, Gold Hahnii, Moonshine, etc. Though snake plant is easy to grow and can be neglected for weeks, you must not be oblivious to its care. After all, proper care is what will make your plant thrive and shine. So familiarize yourself with the plant’s basic needs and preferences. If you’re someone who tends to forget about his/her plant due to traveling or any other reason, this is the number 1 tip for you. Water your snake plant at an interval of 2 to 6 weeks, considering your home temperature and humidity. Make sure the soil gets completely dry before each watering session. Remember, overwatering can rot out your plant. Though snake plants like medium light ( a 10′ placement from south or west window), they can endure high and low light as well. How tolerant plants they are! Just don’t expose them to direct sunlight because that could burn out the plants. Although Sansevierias are highly insect-resistant, they can be caught up by spider mites or mealybugs if you leave them in poor condition. If you get any bug, you should spray the plant with a water hose – this will blast off the insects and their eggs. Don’t use chemicals to get rid of the bugs. Try natural control like neem oil, horticultural oil or insecticidal soap. Snake plants are rapid growers and very easy to propagate. Once you get a plant, you will never need to purchase another one. You can propagate a sansevieria plant by division, by the rhizomes which spread and by leaf cutting. In a garden, these plants typically proliferate on their own through underground rhizomes. In a pot, you should try division method followed by leaf cuttings. The soil nutrition requirement is quite easy for snake plants. As root rot is the key threat to these plants, you should use the soil with a good drainage system. Well… snake plants don’t need fertilizer. You can feed them during the spring season with a coating of worm compost and compost. If you really need to fertilize them, use an all-purpose houseplant fertilizer; that is also not more than 2 times in one season. Never hurry to transplant your sansevierias. These plants actually grow better when you put them in a pot. You can repot your plant in every 2 to 5 years time period. Light intensity and duration affect the growth of snake plant. So, If you put your plants in the low light, you can transplant them conveniently every 5 to 10 years. Snake plants are mildly toxic to pets and can cause nausea, salivation, vomiting, and diarrhea in them. Though the leaves of snake plant aren’t crunchy and appealing to pets, you should keep them away from chewing the plant. Some varieties of snake plants do flower. However, this is a rare phenomenon, and there’s is no certainty that you’d see flowers in your snake plants. If you happen to see so, don’t forget to savor the sweet smell and whitish beauty of the petals. If you’re looking to freshen up your space with some delightful foliage, be sure to check out snake plants. Their strong, architectural, sassy appearance adds quite a charm in any indoor place. Peonies are perennial flowers that bloom once a year during summer. These dazzling flowers are capable of blooming flowers and live up to 100 years. Peonies are also low maintenance plants and thrive better in a colder climate. Even with minimal care, these flowers can live longer. Planting peonies are easy even for beginners. As long as you have the right condition, it is possible to successfully grow these flowers. Peonies have over 6500 different varieties. But there are only 3 most common peonies that you can find in people’s gardens. Tree peonies have woody shrubs and produce enormous flowers that can grow as 10 inches wide. It can also grow as high as 7 feet and stems stay above ground all throughout the year. It blooms normally between April and May. Tree peonies thrive better if planted 4-6 inches below the ground level. They don’t require freezing weather but requires a dormancy period. Forced dormancy can be done by trimming off the bush if there’s no winter in the region. Herbaceous peonies are low maintenance peonies and can produce flowers up to 100 years on the same spot. It requires 5-6 hours of sunlight per day, little water, and good drainage. Herbaceous peonies die back to the ground during winter but reemerge in spring. Herbaceous peonies should be planted half an inch above the ground in warm areas while it needs to be planted in 2 inches above the ground for cool areas. This breed also thrives better in the cold climate. Itoh peonies are hybrid plants that combine the perennial characteristic of herbaceous peonies and the enormous flowers of tree peonies. It also dies back in winter, a similar characteristic that can be found in herbaceous peonies. It normally blooms around June and requires 5-6 hours of sunlight every day. Itoh peonies should be planted half an inch above the ground in warm zones while it needs to be planted in 1 and a half inches above the ground for cool zones. This hybrid is more tolerant of humidity and heat. Choosing the right location is important for peonies. These plants don’t like to be moved around and resist disturbance. Moving them might cause delay the flowers to bloom. So when choosing the location, make sure it will be the permanent spot for your flowers. Don’t plant peonies on the same spot where old peonies have been previously grown. The old soil is more susceptible for fungal infection and has reduced soil nutrients. This can cause problems and risk the peonies growth. When planting peonies, make sure to space them apart by at least 5 feet. This will give peonies enough room to grow. They can grow up to 6 feet wide but they grow very slowly. Also, keep them away from other bushes and trees as they tend to compete for nutrients with peonies. If the soil is not healthy enough for your peonies, enrich the soil by adding well-draining soil, compost, and fertilizers. First, dig between 14-18 inches deep and around 18 inches, creating a hole on your flowerbed. Add compost, fertilizers and then fill the hole with well-draining soil. Leave at least 2 inches from the top. Now that the soil is ready, plant the buds based on the required planting depth from the surface. Or the plants might not grow at all. Add more soil to level out the flowerbed. Press the soil slightly to remove any air pockets or it will dry out the plants. 1. Water the plants thoroughly after planting. Keep the soil moist but not soggy until the plants emerge. And only water them at least once a week after that. No need to water peonies throughout winter as the plants are dormant. 2. No need to use fertilizer but consider it when the peonies’ stem becomes weak and requires more nutrients. 3. Add support cage for your peonies. Peonies tend to fall over the ground without a support. Create a support cage based on the variety of peonies and how tall they can grow. This way it doesn’t limit your plant’s growth while making sure it doesn’t fall over. Add these support cages before Spring or before the plants grow too tall. 4. Remove dead flowers right away or seeds will develop and will take nutrients out of the plants. Botanically known as Rudbeckia hirta, the Black-eyed Susans are native to North America. Because of their beauty, they are found in many gardens throughout America. People sometimes confuse them with sunflowers and asters. They are also known as Gloriosa Daisy. These names of the flower have come because of its dark brown and purple centers. You could also find them enhancing the beauty of vases and bouquets. Versatility is its specialty. It has the ability to grow in super hot, and drought-hit areas. The nectar, that it produces, attracts a variety of insects like butterflies, and bees. Soil: Plant the seeds in loosely covered, well-drained, moist soil. It must have reached at least 70 degrees Fahrenheit so that the germination goes well. It grows well in a number of soil types, but clay and loam are the best ones. If the soil does not have good moisture retention, add some organic matter to improve the same. If everything goes right, the seed must not take less than 7 and more than 30 days to germinate. They don’t care about the pH of the soil, so that’s something you don’t have to worry about. Light: Pick up a place for the Black-eyed Susans where they get quite a lot of sunshine. They also grow well in light or even bright shade. Sufficient light is necessary for these bright flowers to bloom and flush all through the year. Spacing: They grow between 1 to 3 feet tall, and in some cases, they even grow much taller. It also spreads between 12 to 18 inches wide area. Owing to this reason, you must plant the seeds closer to each other. They need plenty of space and air to nourish and flourish. Watering: In the beginning, the Black-eyed Susans need a lot of water to germinate and grow. This period is about one year, so water them enough for the first year of plantation. Once they are established, they have the capability to tolerate the drought conditions as well. Fertilizing: During the growing period, the black-eyed Susans don’t require any additional fertilizers. It is, in fact, recommended that fertilizers must be used in minimum quantity so that the roots and stems of flower don’t get spoiled. Diseases & Insects: One more great quality of the Black-eyed Susan plants is that they do not get infected by the insects quickly. They are quite resistant to the diseases. If, however, in an extreme case, you see something happening to them; spray some organic or chemical based insect repellent. You can also use a fungicide to cure the problem as well. 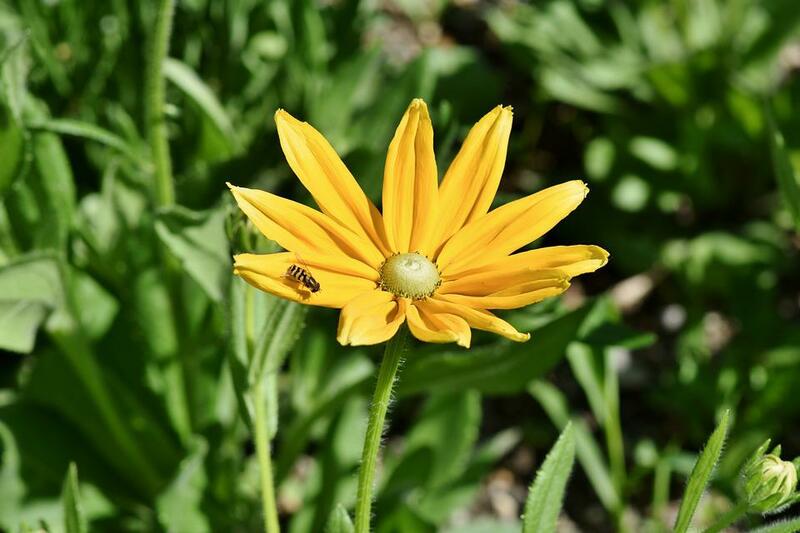 Companion Planting: When grown next to the asters, tall garden phlox, or ornamental grasses, the Black-eyed Susan plants add to the beauty of the flower bed. You must always go for the ones that do not spread as quickly as it does. 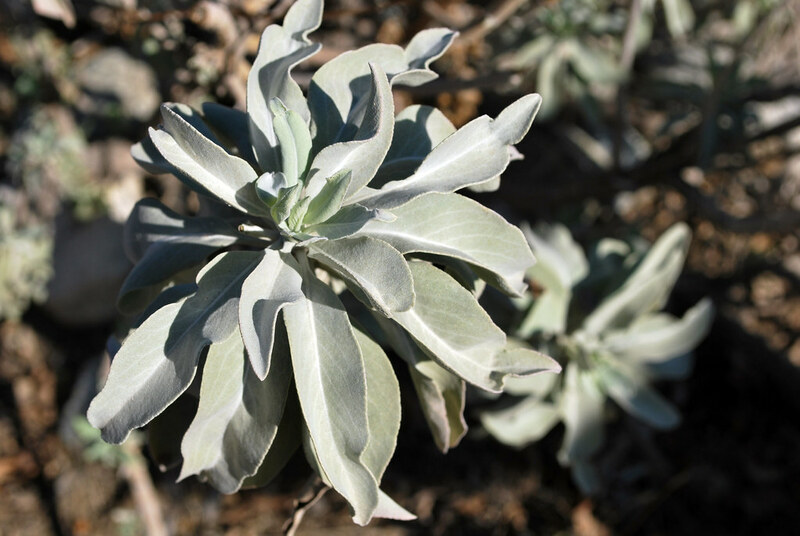 White Sage, scientifically called Salvia Apiana, is a plant that is mostly found in the high desert ecosystems. The plantation of white sage is common in Mountain West and California. It is also known as sacred sage and bee sage. It has been, for centuries, considered a cleansing, purifying, sacred, and protective plant. A refreshing aroma is released when the long, leathery whitish-green leaves of white sage are rubbed between the thumb and the forefinger. Native Americans have been using this plant to ward off negative energy and evil spirits. It has also been found in ceremonies where people use it to seek blessings of protection, health, and prosperity. Not just in the locations where it is grown, people who belong to the other parts of the west also use the plant. Although it is native to the south-western region, it can be grown in other zones as well. White sage not only provides the cleansing and energizing services to the humans, but it also provides food to the native wildlife as well. To grow sacred sage at your place, you need to take care of a few things. Here’s everything you should do to have a white sage grown in your yard. Soil which is capable of draining must be used to grow sacred sage. The ideal soil for a white sage plant is the one which has a lot of decomposing granite in it. Sage does not grow well in the soggy soil. It rather needs natural soil for proper nourishment. For most of the plants out there, the seed is the starting point. 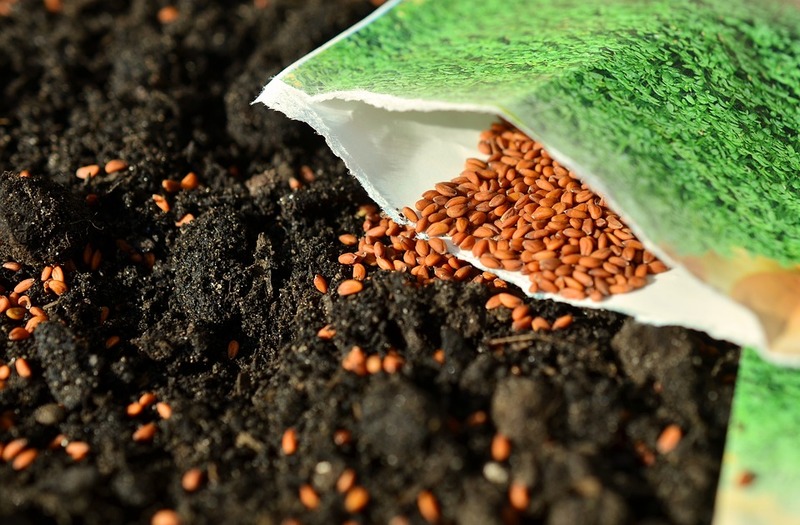 To get better results, make sure you plant the seeds in early spring. Rather than directly seeding it, the much better practice is to plant it in a tray or a pot. Sprinkle the seeds all across the soil surface and water them gently. Place the pot at a location that has a temperature range of 75-80 degrees. Enough lighting is necessary for white sage to grow. Keep the soil lightly moistened and water it the next time when the soil gets dry. Heavily wet soil can cause the roots of white sage to rot very quickly. 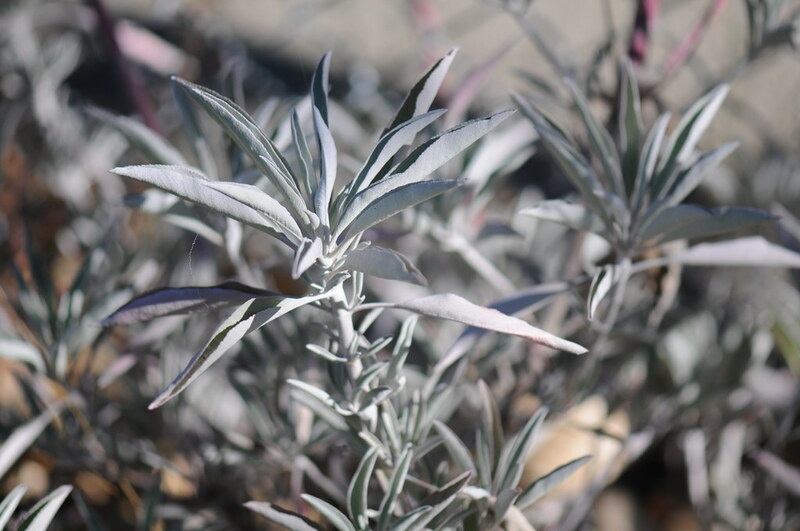 Like most of the other plants, white sage needs sufficient light to grow. It generally demands full sun. Always remember that white sage does not perform well in the shaded conditions. It does not love to be in the cold weather conditions as well. Bee sage does not love to be in the cold weather conditions. Anything below 20 degrees Celsius is cold for a white sage. If you belong to an area where the temperatures go below the desired range, make sure you transplant it indoors. But never keep it in the area where there is a lack of light. A white sage can achieve a height of as much as 6 feet and can get 3-4 feet wider. It requires enough space for the roots to expand and the plant to grow. So make sure you have enough room for a white sage to grow. To enhance the growth of a white sage, you must trim down the dead leaves and limbs of the plant frequently. Sugar Bush, Hollyleaf Cherry, California Sagebrush; are some of the plants with which white sage companions well. Insects like aphids, whiteflies, and red and black flat mite, and spider must not get close to a white sage. Neem oil can be used to keep all these pests away from the white sage. Never over water a white sage. It prefers somewhat dry conditions. Overwatering can damage the plant, something you don’t want to see. Neither is it easy to grow a white sage at a location which is not meant for survival nor is it impossible. All it needs is some care and maintenance so that it can provide you with its qualities that most people crave for. Follow the steps given above and take enough care of the plant to have it in your yard.